The soil at the homestead is so poor. I want a way to grow veggies right now and permaculture methods take time. I could go conventional by plowing and fertilizing, but that takes a significant amount of $. I think I can do something quickly. I’m thinking about Aquaponics. I’m lucky to have some friends that are interested in aquaponics and are willing to share their skills and physical effort. The basic idea is that you overstock a pond with fish. You circulate the pond water through a system of plants. The uneaten fishfood and fish waste is cleaned from the water by the plants. The clean water goes back to the pond. There is a lot of aquaponics information on the Interweb. I recommend you check it out. Yep, it’s a kiddie pool. And Bubba photo bombed it. The pool is 12 feet wide and 30 inches tall. It came with a pump that I’m not going to trust. Maybe I’ll use it as a backup pump. It holds 1,718 gallons of water according to the box. The plan is to raise tilapia. Not my favorite fish, but they are plant eaters, which solves many eating issues. This is a test and tilapia are easy. I should be able to stock over 800 tilapia in ideal conditions. The plan is to fill the pool and make sure it doesn’t fail. We’ll leave the water in it while the rest of the AP system comes together. Something that might happen is an algae bloom in the water. Algae is not my friend, so the water needs to be shaded from the sun. 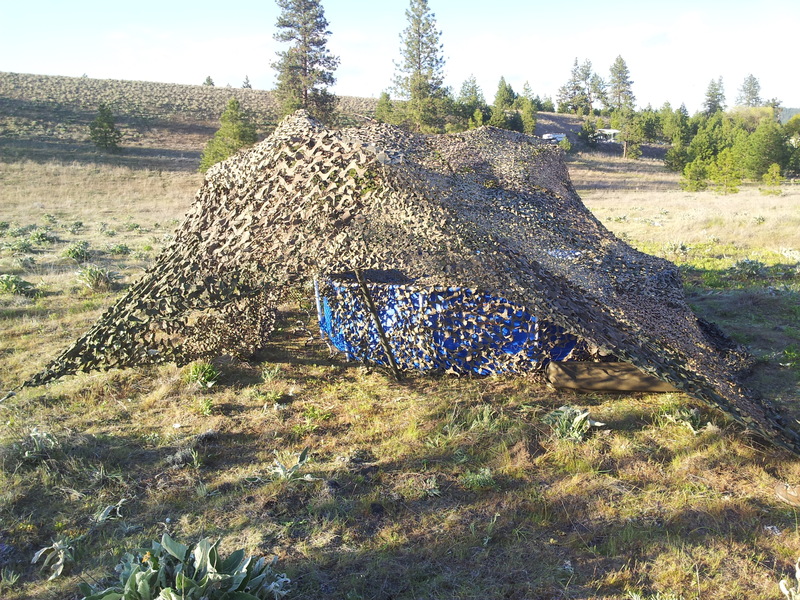 Yep, thats a camo net. They come in two shapes: diamond and hex. We decided to put the diamond across the pool. Fiddling with the camo brought back a lot of memories. Okay, this was just a very good excuse to put up the camo. I’m very pleased! This entry was posted in Aquaponics and tagged aquaponics by admin. Bookmark the permalink. Soon you will have to get a youtube channel going. Looking forward! Now if the camo would stay up!